1. Proper procedures are followed at all locations? 2. Store appearances are kept up? 3. Employees are making customer service a top priority? 4. All sales opportunities are turned into actual sales? These and many other questions can be answered by our Mystery Shoppers. What is a Mystery Shopper? A person who comes to your location and does what any normal customer would do. The only difference is that after he leaves he completes a questionnaire telling you everything he experienced on his visit. 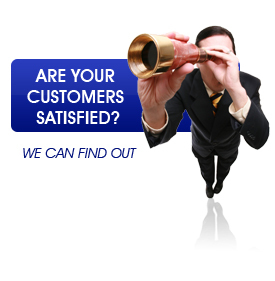 Our Mystery Shoppers are trained to meet the specifics of your program. Our shoppers visit your locations as directed and conduct a normal customer inquiry and/or transaction. The shoppers then complete a questionnaire custom-designed for your business, which covers all aspects of their visit. The completed questionnaires are sent to us for an accuracy review. Then they are forwarded to you immediately. You review the reports with management and staff and plan the action to be taken. Shoppers, Inc. will use Mystery Shoppers from the areas of your locations, to ensure that they fit in as normal customers. Each shopper is recruited for their communication and observation skills, to ensure accuracy. You may specify that shoppers meet certain demographics if desired. Each program is unique and requires a specific price proposal. Generally, shopper visits range from $15-75 each, and telephone calls from $10-25 each. The price depends on length of time spent by the shopper on the visit or call and the questionnaire. Discounts are available and based on volume. Click Here For Your Price Quote.